I like pastry mash-ups, but here's a savoury mash-up that mixes not two but THREE popular recipes! 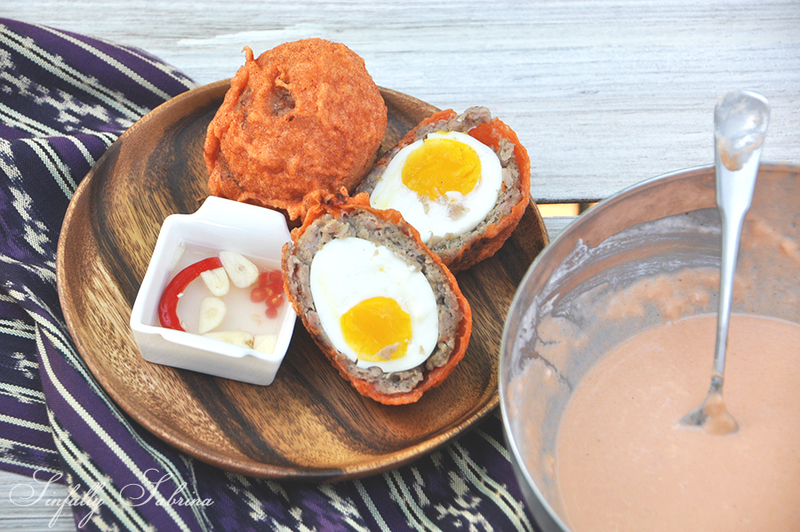 Two recipes hailing from the Philippines: Ilocos Empanada and Kwek Kwek. The other is a bar chow dish that regained its popularity in the last two years, Scotch Eggs. I call it KWETCH EGGS! The two recipes from my country (Philippines) are actually popular street foods. The latter, Kwek Kwek can be found in almost every corner of your village. It's reminiscent of our childhood summer days. Giving all these recipes an upgrade was so fun to do. I imagine that it would also be great served on top of a salad. You see, the Vigan longanisa (sausage) is very vinegar-y and garlic-y. So dressing the salad with a citrus-honey combo sounds like a heavenly match. But you can still enjoy this plain or with rice, whatever works for you. As for me, I gotta go! I HAVE to eat these Kwetch Eggs while its still piping hot! Are you jealous? Go, make it already! Place eggs in a small saucepan and put cold/tap water until the edge of the eggs. Bring to a boil, let boil for 4 minutes. Immediately place eggs in a cold water bath and let cool. Peel eggs when cool. Heat oil for deep-frying, until about 300 degrees Fahrenheit. Remove the casing of the Vigan longanisa and wrap the sausage meat around the eggs, about 2 links per eggs. Batter: Combine all purpose flour, cornstarch, annatto powder, salt and pepper in a bowl. Add water and gently mix until smooth and free of lumps. Roll the eggs with longanisa in flour for a thin coat then dunk into the batter. Carefully drop the batter-covered eggs into the hot oil and fry for 4-5 mins. each. Do not crowd the pan, maximum of 2 eggs at at time. Drain when cooked with a strainer or paper towel.